Did you know that every single day you have a choice? Be grumpy or be happy. Sometimes it's so much easier to take the grumpier route, I know. But the happier side of things...well, makes you happy. It's the little things, lovey. You have to find the joy in the little things. The ordinary forms of happiness can give you the simplest of joys. When you figure what that brand of joy is for you. Take it in your hands. It will love you back. I don't have time to be unhappy. Why waste time frowning when you can be smiling? But that makes it even better. What's your brand of joy? What simple little thing does it for you? 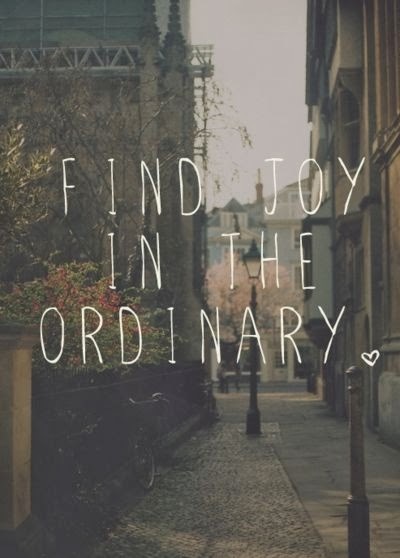 "Find joy in the ordinary!" Yup. Joy is in the little details of our daily lives. Absolutely true! I love finding joy in the ordinary. Thanks for the reminder. So glad to have coffee with you here and find joys in the ordinary. Wonderful.